Note: The moments 1-4 had the same number of votes and their order is alphabetical. Also true for moments 5-15. Nirat: Akecheta’s journey to find his lost love is one of those TV moments that stay with you forever. To have felt a love so powerful you confront all kinds of unfamiliar things (once you wake up in a strange, new world) is something I wish to feel in my lifetime. From the moment Akecheta wakes his unwavering determination to find Kohana is admirable. The way the scene mirrors Maeve’s walk through the facility from Season 1 is stunningly tragic because both hosts come face to face with the terrors humans have caused upon those that are like them. To see that you are merely puppets in their play and still have the courage to go on shows what resilience they possess. Ramin Djawadi’s gorgeous cover of Heart Shaped Box elevates such an emotional scene. As Akecheta walks further, deeper into the belly of the beast, the music continues as we see him walk into the cold storage graveyard with the hosts standing lifeless, like toys discarded by their owners, it's devastating. Their naked bodies stand there, still and silent, everything that would give them value and the ability to defend themselves is stripped from them. When the music finally stops and a softer score takes over it's Zahn McClarnon’s masterful performance that draws your soul in with such incredible vulnerability, something rarely ever seen in a man. I’ve never felt so heartbroken until I heard his declaration, "My pain was selfish. Because it was never only mine. For every body in this place there was someone who mourned their loss. Even if they didn't know why”. To be able to put aside your own desires and realize that you can’t be selfish because your desires are not important requires such a great deal of strength and Akecheta’s selflessness is something I’d hardly ever seen. It’s the greatest tragedy that Zahn McClarnon’s beautiful showcase of human emotion was not recognized by the award shows for it was truly one of the most poignant pieces of television I watched this year and I feel grateful to have been able to witness that magic. Even after this scene, after everything that the humans did for the Native Americans hosts to be seen as savages they were willing to protect Maeve’s daughter and the true tragedy is how people in power have always constructed narratives to show anyone they deem different as evil. “Mi cante ki yu ha ya ye”, take my heart when you go Westworld for I am forever grateful to have been a viewer of yours. 14. THE WALKING DEAD, Episode: "What Comes After", The Scene: Rick's "death"
Emmaline: We all knew something dramatic was coming after it was announced that Andrew Lincoln would be leaving the show, but seeing Rick sacrifice himself for his family as they looked on from a distance, unable to do anything but cry, hit fans hard and kickstarted a much-needed reboot of the show. Beth: Simply put, this was the only way it could end for these two. The scene itself was heartbreaking yet beautiful because the two brothers went out on their own terms together. Marko: Always & Forever never felt more tragic and was never more heartbreaking. The final moments of The Originals' five season run peaked with heartbreaking moment when Elijah decided to join his brother in the forever after. The perfect ending to a disturbing tale of love, brotherhood and forgiveness. Mads: One of the most poignant, terrifying, and profound television reveals I've ever seen. The camerawork when Nell crashes through multiple timelines and scenes was masterful and I won't be forgetting this brilliant episode of television for a long time. Marko: For a fast paced show with so many twists and turns it is always important for the show to reinvent itself but keep true to its nature. And that is just what the writers did in the final moments of season two. They found a way to keep the story believable but turn it completely upside down. June leaving her newborn kid so she could go back and save Hannah was a terrifyingly heartbreaking move, and the fierce power and heartbreak in Elisabeth Moss / June's eyes was simply everything. Cecile: It's such a layered scene, she stays for Hannah and for the other Handmaids who didn't have the opportunity to flee, for the relics of a world she's still fighting to save. Cecile: The moment when Sutton realizes she doesn't need to sacrifice her relationship for her career, and Richard simultaneously decides to get her back after 2 seasons of angst! Sutton deserves the best and it was great to finally see her get what she wanted and needed. Francesco B: Elizabeth, Philip and Page are on a train that will lead them to Canada. When the train leaves the station, Elizabeth sees Paige on the tracks. She has abandoned her parents. The consequences of their choices will forever haunt them. Elizabeth's pain is so vivid and powerful, even if she can't say a word. Jimmy: Clarke and Bellamy awake on board the Eligius III ship and see a new planet looming out the window. This is a big moment for the pair as they are the first to lay eyes on this new planet aside from Monty, who we learn died during the 100 year voyage along with Harper. Diana: Clarke and Bellamy awake on board the Eligius ship. They both see the planet Monty had described to prepare the two of them. I think that was a great moment for the pair - romantic or platonic, they're the head and heart of the show. Justyna: A fantastic scene. A brilliant season. A marvellous show. I could name at least a few Best TV Moments of the year from this series alone but if there's one that I absolutely had to include in the article it has to be this 11-minute long one shot. It's such a great achievement and inspiration for others to follow. The entire cast & crew bring their A-game and leave the viewers breathless. If this really is a goodbye, then I couldn't have asked for a better season to end the series. Ami G: This scene occurred when Matt got stuck in the prison riot, and fought his way out. This whole 11-min scene was filmed in one take, and it was so visually intriguing. The whole way the camera followed the action, and the lights were flashing, and how everything felt so quick and panicky and edge-of-your-seat style but also so long and enduring was amazing. I didn't know how Matt could still be conscious and breathing after that fight, wow! Justyna: This is one of my favorite shows on TV so there were many, many moments that I could include here as Best TV of the Year. Basically everything related to Fitz for starters, from his proposal, through his change to his death. But in the end I decided to highlight the scene that stayed with me the longest and said so much about the series as a whole. Of course it takes place in the 100th episode, making it all the more special and memorable to me. Coulson is forced to face his fear, represented by "Mike Peterson", the image of the first person these Agents of SHIELD saved together. The scene is perfectly done, wonderfully acted (special shoutout to Clark Gregg) and edited, with one of my favorite scores in the background and even a line from the very first moment that made me love this series ("It matters who you are"). There's also a reference to The Avengers and I couldn't have asked for more. Zoé F: Mike comes back to convince Coulson it's all been a dream. For the 100th episode, the writers decided to go big and bold. Coulson goes down into a fear dimension, where he meets a simulation of Mike Peterson, who attempts to convince him that he did really die on that operating table. The entire series has been a dream. Except, of course, Coulson realizes the fear dimension was just trying to get to him. Justyna: First of all, if you haven't seen the show yet, I highly recommend it. There's so many things happening in this one moment that it seems impossible to cover everything with a few short sentences. The series' main story and its endgame are revealed when both the characters and the viewers slowly realize the truth about Hannah. It turns out Cole was always meant to be erased from time, if time was to continue. Everything he's done, every attempt to change the world, nothing could truly make a permanent impact, because his presence, his family were the impossible this whole time. Just as this truth is revealed, Cole is forced to watch his mother die. Hannah dies in his arms, after saving his life one last time, as he slowly understands the meaning of her final words. And then there's Cassie, making her own decision to release the virus, to become the person responsible for the worst thing in the world, the same thing they've spent all those years trying to prevent. It's the circle of the story, serpent eating its own tail. This is the moment that shows the genius of the writers, the talent of the actors and the brilliant work of the entire cast & crew overall. The series finale is perfectly done, but this is the defining moment, the part where the beginning meets the end. It makes one wish to watch the show all over again. Kudos! Luana: This Is Us had been teasing us with this moment for too long but when it came it was just as heartbreaking as we expected. It even generated a media movement calling for the death of Crock-Pots, not many shows can have that level of impact but this one is worth it. Claire: I am not even a regular watcher of this show, but I felt compelled to watch and was emotionally jolted by the outcome; terrific writing and acting. Luana: This show was absolutely perfect, it was a study of human psychology and the darkest places people can go. It was brilliantly written, acted and directed, but, overall, it was absolutely haunting, a story made to stay with us for years to come, and we could not have asked for a better actress than Amy Adams to become the broken Camille Preaker. Her face in this scene said it all, after feeling like she'd finally found happiness, maybe even someone to actually call family, she realizes her little sister is a monster and perhaps there's no way she can ever escape the darkness. The most heartbreaking thing is she doesn't even look completely surprised there will be no happy ending for her. Cecile: Probably the most chilling scene of the whole series (and there were a lot to pick from!). Both actresses nail it, making it unforgettable and putting the entire show in perspective. Mads: This was such a cool way to reveal the truth about the real murderer in Wind Gap. Even though I had read the book beforehand I wasn't expecting this ending and it was completely chilling. Eliza Scanlen deserves as much praise as Amy Adams for this show in my opinion. Diana: Chloe discovers Lucifer's real face - and she's horrified. That was a reveal moment. I can't wait to see what's coming in season 4, because at this point I hope Detective Decker will open her eyes and realizes she's been in love with the Devil the whole time. Plus, the music playing in the background was perfect for that moment - "The beginning of the end" by Klergy. Luana: This was a very awaited moment and it was only made bigger by the uproar that called for the show's salvation via Netflix and leaving us all eagerly awaiting to see the fallout of this epic scene. Emma Lynn: Chloe finally sees Lucifer's devil face - the shock and horror on her face as she realized that he had been telling her the truth about who he was the entire time was everything I had hoped this reveal would be. Beth: After a disaster of a day, Jake and Amy wed in a way that fit the show and them. Justyna: It's just a perfect celebration of one of the best TV couples. Of course these two end up being married next to their workplace, surrounded by their loved ones. Holt's officiating speech, the wedding vows, the little references to their past, it all works wonderfully together making this a scene to remember. These are our picks. 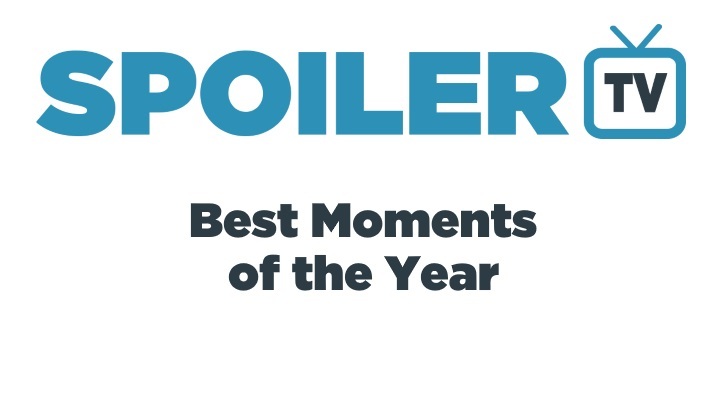 Check out the choices of SpoilerTV Readers for Best TV Moments of Year 2018 here! And share your thoughts in the comments below.